This summer, where everything is centred around Rio de Janeiro Olympics 2016, you can live like a Carioca without flying to Brazil! Right here at Las Iguanas branches, you can adopt and embrace a few Brazilian traits through food and cocktails. The special fixed Brazilian menu is fantastic value at 2 courses and a drink for £17 or 3 courses and a drink for £20. Starting with Caipirinhas – Brazil’s favourite drink, the choice at Las Iguanas is incredible. I fell in love with the Orange and Ginger Caipirinha, which is Magnifica cachaça stirred with fresh lime & orange sweetened with fiery ginger syrup. It made me forget my beloved Mojito for the night! For starters I chose the Bolinhos, which are crispy crab & prawn croquettes with zingy lime aioli. So so delicious! Perfect crisp exterior and flavoursome soft interior. Amit went for the Dadinhos, which are a Brazilian favourite of crispy cheesy cubes served with sticky chilli jam. I ate most of his starters as they were really good too. My main was Bahian coconut chicken, which is chicken pan-fried in cumin, coriander & cayenne & cooked in a creamy coconut sauce with ginger, garlic, tomatoes & coriander. Served with spring onion rice & shredded greens. So full of flavour and perfectly cooked. Amit’s main was the Halloumi Churrasco skewers, which were flame-grilled honey-glazed halloumi, beetroot, artichoke, red onion & pepper skewers, with honey peri-peri sauce, salad & cassava fries or sweet potato mash. What a dreamy combination. Neither of us had had halloumi in this way before and were both really pleasantly surprised. 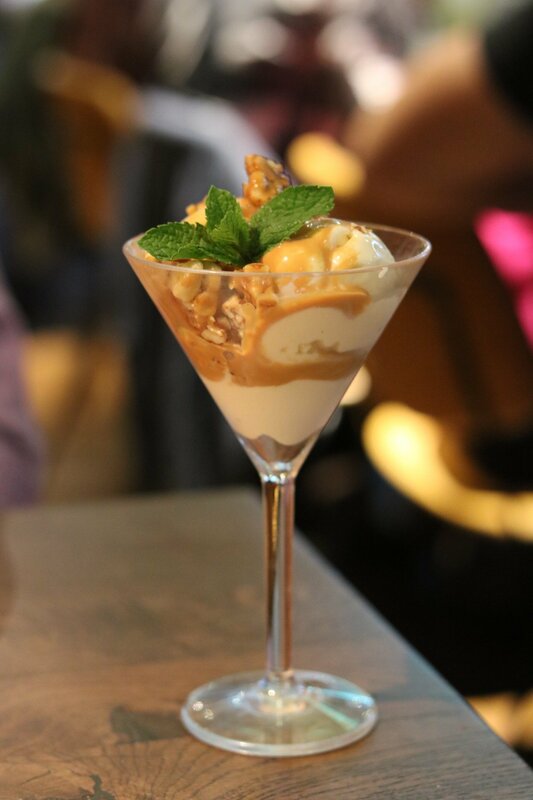 My favourite part of the meal was dessert, and I went for the Pé de moleque ice cream, which is a vanilla ice cream topped with dulce de leche caramel & crushed caramelised nuts. Oh yes! Every bit as perfect as I imagined it to be when I read it on the menu. A truly delightful dessert. I was really impressed with the Carioca menu and thought it was incredibly good value for such amazing food. There is a really good choice for vegetarians and non-vegetarians. Las Iguanas is a perfect restaurant for a fun catch up with friends over lovely cocktails and food. The service was really good and really quick, and the atmosphere was really good, ambience was lovely and enjoyed the entire experience. My meal was complimentary but all photos and opinions are my own.